In his inauguration address, the new Rector and Vice-Chancellor, Prof Frederick Fourie, said that his vision for the University of the Free State was for it to be a University of excellence, equity and innovation – a leader in research, teaching, community service, adult learning, transformation, non-racialism, non-sexism, multiculturality and multilingualism; a contributor to South Africa and the African continent’s growth and development; a truly South African university. The University of the Free State has played an important role in the transformation of higher education in South Africa, with its model for multiculturalism and its management of diversity. The choice of a parallel-medium teaching policy offers students a distinct advantage in their preparation to cope with the realities, pressures and demands of South African society. academic entrepreneurship to meet the challenges of modern-day higher education. The University of the Free State is situated in Bloemfontein, the capital of the Free State Province. Bloemfontein is a modern city offering a full range of recreational, commercial and educational facilities. Yet it retains the laid-back atmosphere that reflects its agricultural beginnings. The University campus is referred to as an academic village, as all lecture halls and laboratories, offices, student residences, sports and student facilities and even a training hospital are located within walking distance on a secure campus. The campus, in turn, is a short distance from the city centre. The admission requirements for all degrees are a matriculation exemption certificate or equivalent. In some cases admission can also be obtained by prior learning or on the basis of age and experience. For admission to some courses, minimum pass marks for certain matriculation subjects are required. Please contact the University for further information. Students from abroad are required to pass an English language proficiency test. The University boasts sports facilities for more than 20 sports, medical facilites and cultural activities, ranging from the political arena to outdoor life and the creative arts. It has a student centre, a student newspaper and campus radio station. In addition, students have access to an extensive world-class library, a career and guidance centre, a modern student theatre and a computer centre. Every faculty has proven itself with ground-breaking research projects. A variety of co-operation agreements with international institutions on all continents assure relevance and the highest standards of research and development. Faculties at the University of the Free State include: Natural and Agricultural Sciences Economic and Management Sciences Humanities Theology Law and Health Sciences. The University offers a range of degree, diploma and certificate courses. The long-held dream of an institution of higher education in the Free State became a reality in 1904 when the Grey University College opened its doors. Initially, the tuition medium was English, but later on this changed to be bilingual and included Afrikaans. The name was changed to the University College of the Orange Free State. In the late 1940s, the medium of instruction was changed to Afrikaans. 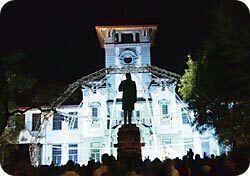 The University was declared a fully-fledged, independent university in 1950 and the name was again changed to the University of the Orange Free State. In 1993, a system of parallel-medium tuition was adopted. Today, all classes are currently offered in Afrikaans and English. 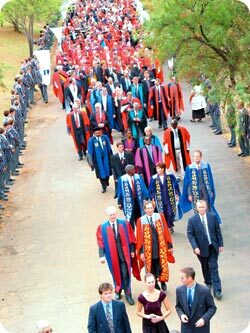 Subsequent to the adoption in 1999 of a new university statute, the UFS entered a significant growth period. Today, the University of the Free State boasts more students than ever before in its history. 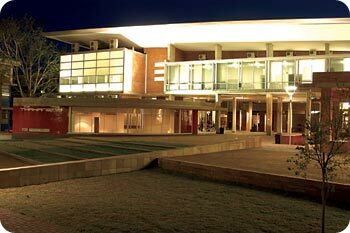 In February 2001, the University lived through another name change, when it became the University of the Free State. The new name was adopted to reflect the real character of the institution and its environment. In 2004, the University celebrates 100 years since it was founded. Its Centenary celebrations form a cardinal part of the existence of this university.